Welcome to Cushion! Our goal is to bring peace of mind to freelancers by helping you stay on track of your financial goals and forecast your schedule to avoid unexpected pileups. When you first enter Cushion, you’ll notice a few main tabs at the top. Switch between them to see the different sections of the app. 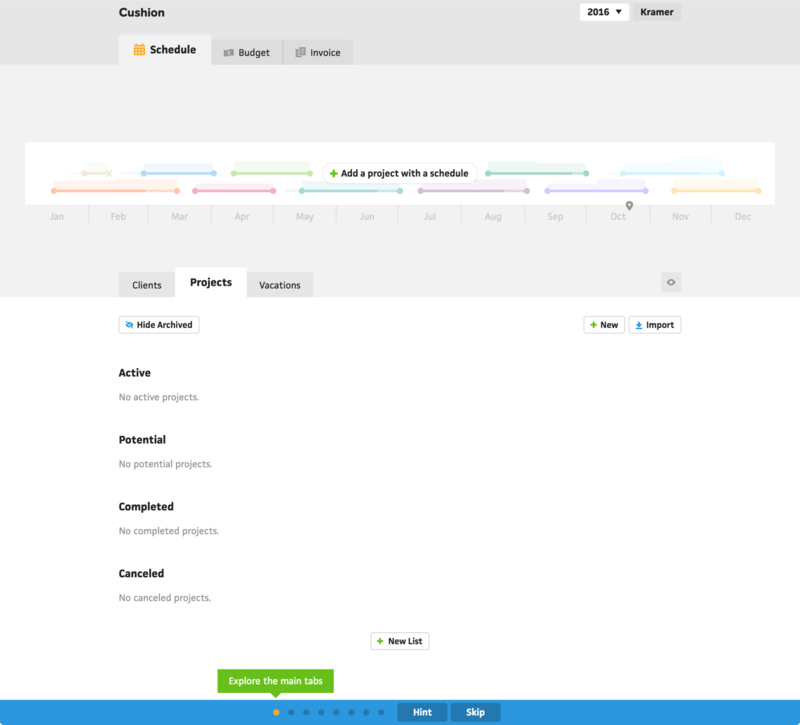 The scheduling view is used for planning projects and tracking invoices. Cushion highlights when you’re available next and when you’re overbooked. You can also zoom into the scheduling view by clicking on a month. Use the view settings on the right to show/hide parts of the graph. The budgeting view consists of a bar graph that fills up using your income or expenses, depending on which section you’re in. Solid bars represent paid amounts, outlined bars represent pending amounts, and dashed bars represent estimated amounts. The budgeting view also has a monthly graph, which can be selected in the view settings on the right. When viewing your monthly income, Cushion will split your financial goal into monthly goals, so you can see how you're doing month-to-month. If you don’t reach your goal one month, Cushion will automatically adjust next month’s goal, so you can stay on track for the end of the year.